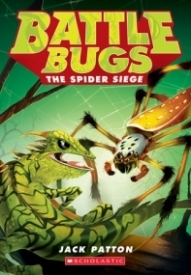 Never leave a bug behind-- collect all the Battle Bugs books! Back to Bug Island! General Komodo and his army are on the attack. Komodo has assembled a fleet of fearsome horned lizards for a mountain assault. The Battle Bugs have to come up with an airtight plan-or risk losing everything. Max's return to Bug Island is dangerous--but the Battle Bugs need his help ! After seeing a spider with an impressive web on a family camping trip, Max once again travels magically to Bug Island, where the lizards are once again encroaching on the bugs. General Komodo has found a pass through the mountains, and Barton needs help planning battle strategy. Things look grim, but Max realizes that the Golden Orb Weaver spiders can use their webs to block off the pass and by the bugs some time. He also has the shy Trap Door Spider, Webster, dig burrows under the bug encampment just in case. While the lizards are held off for a bit, they eventually break through, but are ambushed brilliantly by the bombardier beetles and are sent on their way. Termites are then used to close off the path, but what will happen when the lizards find another way to attack the bugs? While this is a good adventure series for younger readers, this volume did have a couple of disturbing acts of bug violence-- a scorpion stinger is driven into a lizard's open mouth, fire ants sting the lizards and leave them moaning in pain, and Barton grabs General Komodo's tongue with his pincers! Readers who are sensitive to this sort of graphic violence, even if it is concerning bugs, might want to pass. The battle strategy involving the bugs is really brilliant. While the spiders are using extra strength webbing, the lizards are using the spiky headed variety of their kind to rip through it. For me, the lizards almost win this battle with their ingenuity-- they have tree snakes and chameleons serving as spies, and ably counter every defense that Max comes up with. The inclusion of Webster, the shy Trap Door Spider, was interesting, and Spike and Barton are certainly distinct personalities. This series definitely lends itself to some imaginative play, and I can see young bug enthusiasts planning their battle strategies with an entomological guide by their side. If they have a magnifying glass, they'll have to be careful with it or the lizards will be the least of their "army's" worries!